The fight for Antwerp's most important and extensively fortified area in 1914 has been relegated to minor importance in histories on the Great War. Since it did not live up to its reputation of being the "National Redoubt" from where the Belgian government and army could await help from friendly powers, there is much justification to this view. Imagine how things might have evolved differently had the huge fortified area been the linchpin in the Allied left flank, instead of Nieuport and the inundated Yser plain. The German campaign to take Antwerp did not last more than some two weeks of fighting. Hence there are no battlefields to reconnoiter, except for the more than two dozen forts that still dot the landscape around the city in a huge semicircle, up to 15 kms out from the city center. Some of these can be visited as they serve a number of everyday purposes, from café/restaurant to schools, recreation parks, and offices for various municipal services. 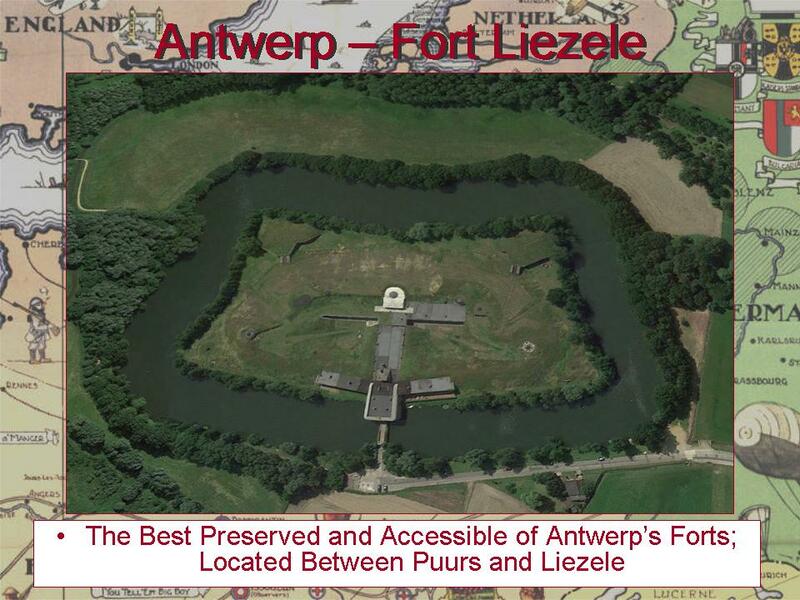 One of the forts to the south of the city, Fort Liezele, is being restored and can be visited on weekends. 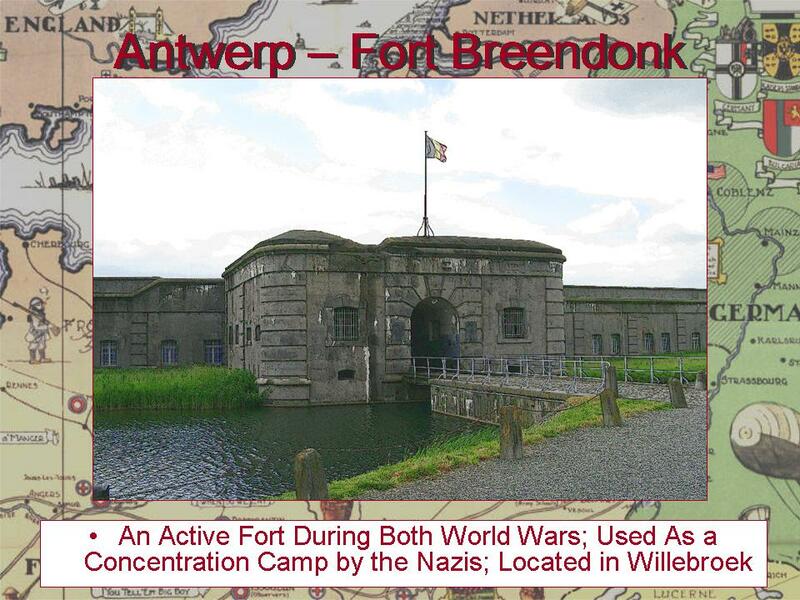 During WWII, another of the Antwerp forts, at Breendonck, similar to all the others, was used by the German occupiers as a concentration camp for political prisoners and resistance fighters and also as a transportation staging area for those to be deported to death camps in the east. This fort, now a national monument, can be visited every day except Mondays and holidays. 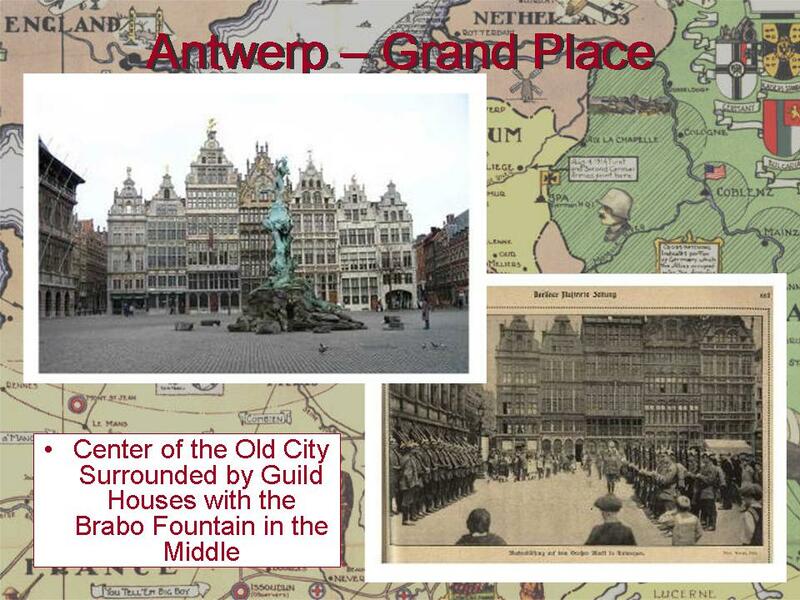 In the city of Antwerp itself little can be seen that attests to the fighting during the Great War, except for numerous postwar monuments and commemorative plaques. 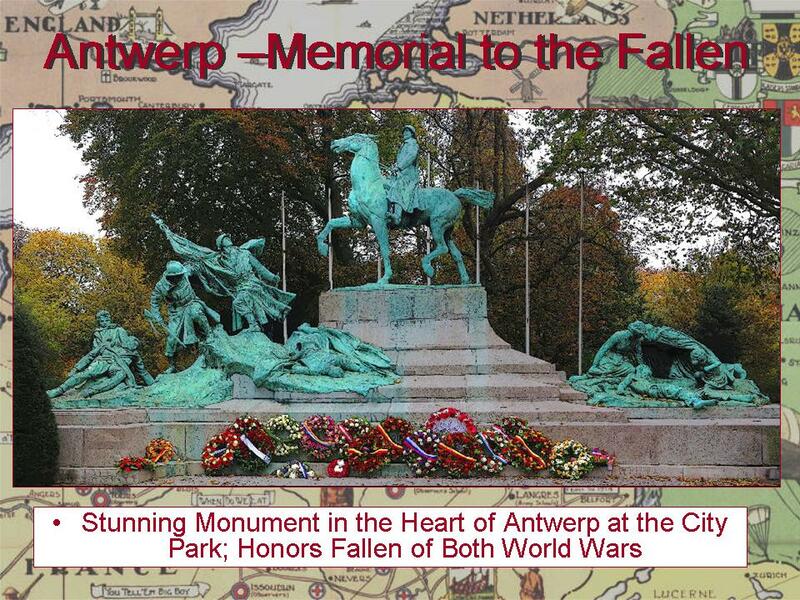 The most notable and grandiose is the monumental statue group in honor of King Albert and the soldiers of the army. 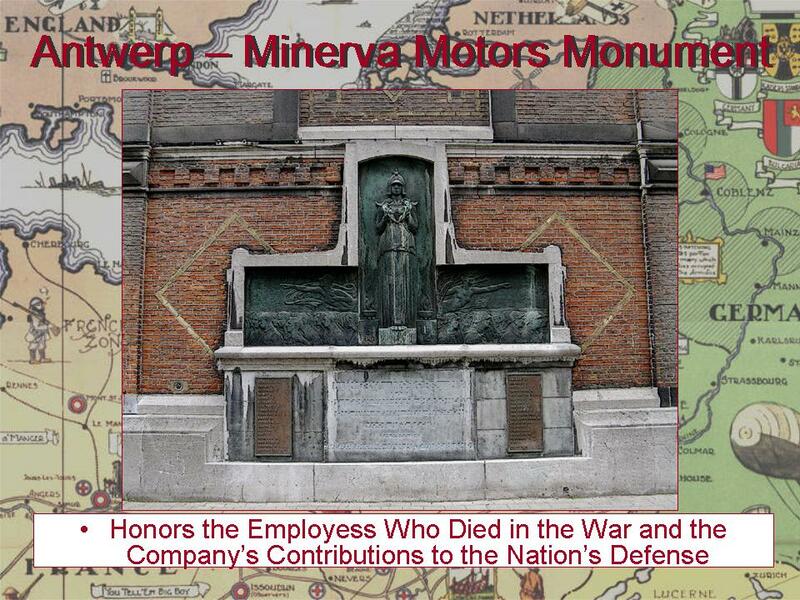 Another is dedicated to the fallen workers of the Minerva Motorcar factory, a metal working firm that rebuilt their luxury cars into serviceable and efficient armored cars, outfitted with machine guns and rotating turret. These armored vehicles were the terror of the Germans during the siege in 1914. Since the [South American battleship building] naval rivalry began in 1910, financial conditions, which were none too good then, have grown worse; and as time approaches for the final payment, feeling has been growing in these countries that perhaps they are much more in need of money than of battleships. The situation alluded to above led to an important development in 1914. 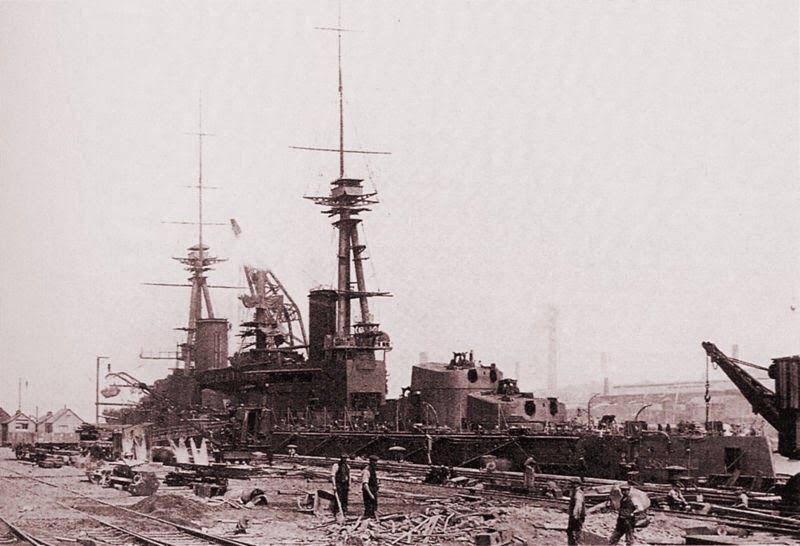 The dreadnought shown fitting out at a Tyneside shipyard in early 1914 started out as the Brazilian Rio de Janeiro. It was subsequently sold by Brazil to Turkey as the Sultân Osmân-ı Evvel. Then as war broke out Britain, fearful of a German-Turkish alliance, seized the now completed ship, renaming it HMS Agincourt. This in-turn built considerable ill-will in Turkey where the purchase of the ship had been partially funded by public subscription. Positive [arms-control] proposals have not yet reached Germany [from Britain]. If they did they would certainly be examined with good will. Serbia desires the maintenance of peace in the Balkans, and that complications be avoided, for Serbia needs peace . . . In order to recuperate and in order that she may arm herself afresh for the defence of Serbian national interests. A future Anglo-German war will become an armed conflict between two groups of powers. The central factor of the period of world history through which we are now passing is the rivalry between England and Germany. This rivalry must inevitable lead to an armed struggle between them, the issue of which will, in all probability, prove fatal to the vanqueished side. . . the future Anglo-German war will undoubtedly be transformed into an armed conflict between two groups of powers. 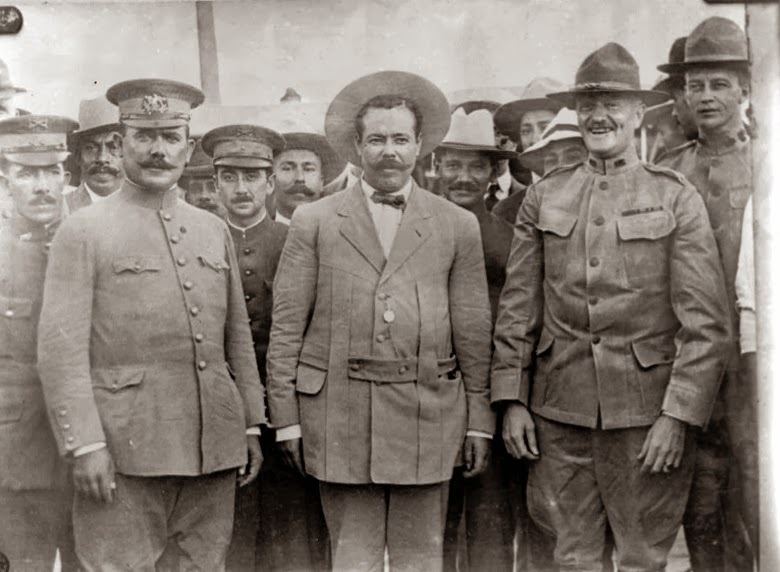 . .
No great man in the public eye at present understands the value of publicity to greatness better than Francisco [Pancho] Villa. 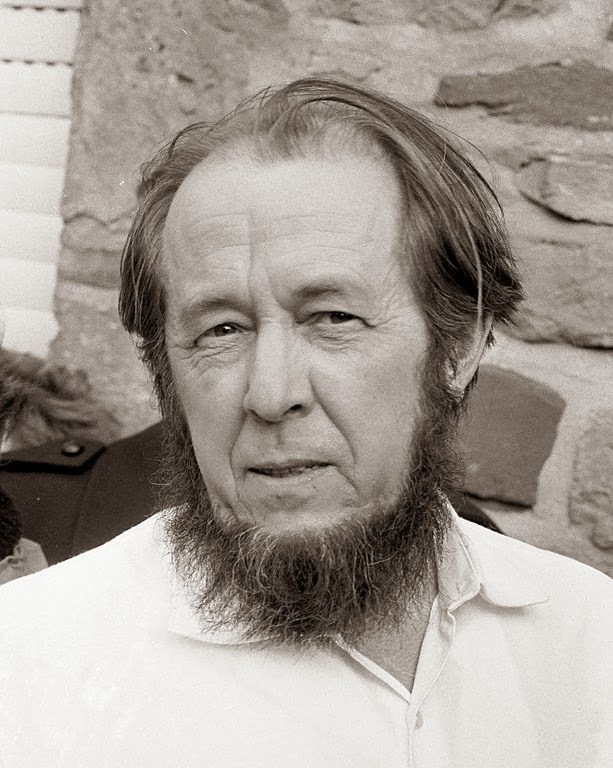 To chronicle the roots of the catastrophe of the Russian Revolution and Soviet communism, Alexander Solzhenitsyn explored the First World War. Here is a selection of his most famous work on the war, August 1914. It is a depiction of the suicide of General Alexandr Samsonov, the Russian commander who lost the bulk of his 2nd Army at Tannenberg and committed suicide at the end of the battle. But they could never sit for long. The brief hours of night would soon slip away and with them, their last chance. Toward midnight, the moon lowered and was clouded over, together with the stars. They could see nothing in the dark as they stumbled along in single file sensing each other's presence only by the crackle of twigs underfoot and their own heavy breathing. The forest trail had got much worse. It was swampy and sometimes the way was barred by impenetrable undergrowth or by dense thickets of young pines. They thought it would be dangerous to stray in the direction of Willenburg where they could easily run into a German patrol. They bunched closer together and kept calling out in low voices. Now there were no more halts. 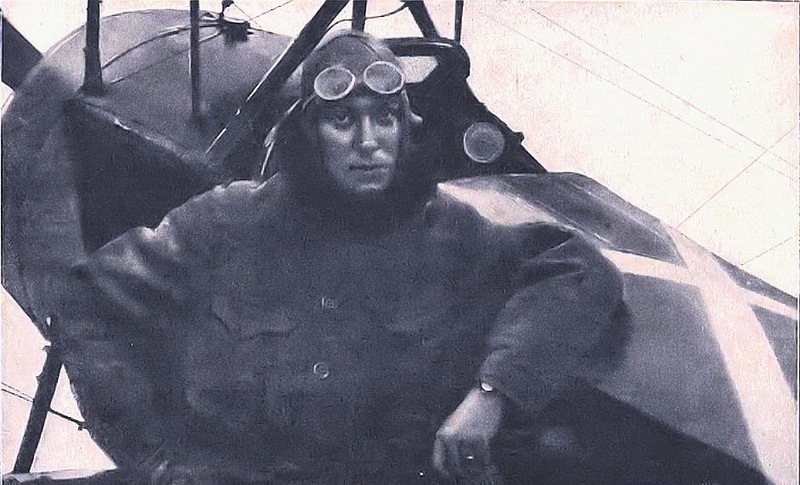 Whenever they came to ditches, Kupchik and a Cossack captain gripped Samsonov by the arms and pulled him across. What Samsonov found most burdensome was his body. Only his body. It dragged him down into pain, suffering, shame and disgrace. To rid himself of the disgrace, the pain and the burden, all he needed to do was to rid himself of his body. It would mean passing over to freedom—something he longed for—like taking a first really deep breath with his congested lungs. Earlier that night he had been reduced to a mere sacrificial idol for his staff officers. Now, after midnight, he had become more like a pillar of stone that could scarcely be moved any longer. The hardest thing was to get away from Kupchik, who kept right behind him, sometimes touching his back or his arm. But as they skirted a thicket, Samsonov tricked his orderly. He slipped to one side and stood dead still. The sound of branches crackling and breaking, and the lumbering tread of heavy footsteps faded away. It was quiet everywhere. The whole world was hushed. Armies had ceased to battle. Only a fresh night breeze stirred, ruffling the treetops. This forest was not hostile. It belonged neither to the Germans nor to the Russians but to God, and it gave refuge to all His creatures. Leaning against a tree trunk, Samsonov stood for a moment and listened to the sound of the forest. Near by, the torn pine bark creaked in the wind. And above it all, just under the sky: the cleansing sigh of the treetops. He felt more and more at peace. He had come to the end of his long soldier's career. He was abandoning himself to danger and death. Now ready to die, he had never imagined that it could be so simple, and such a release. But the only trouble was that suicide is held to be a sin. The hammer of his revolver clicked back softly. Samsonov placed it in his cap, which had fallen to the ground. He took off his saber and kissed it. He groped for the locket with his wife's portrait and kissed it too. He walked a few steps to a place where the sky showed through clearly. It was clouded over except for one tiny star that vanished, then appeared again. Dropping to his knees on the warm pine needles, he prayed with his face lifted to the star —he did not know which way was east. First he said the ordinary prayers, then none at all. He just knelt, looked at the sky and breathed. Now he groaned out loud, without restraint, like any other dying forest creature: "Lord, forgive me, if You can, and receive me. You see: There was nothing else I could do, there is nothing I can do." His World War I works are getting hard to find. Amazon.com was surprisingly unhelpful and you might have to do some searching for August 1914, November 1916, and Lenin in Zurich to find copies. It will be worth your effort, though. The title notwithstanding, this book is a very good preparatory reading for WWI. Dr. Mosier covers a number of topics: geography and the French ignorance of their country, French and German history prior to WWI, railroads and their usefulness/limitations, and military preparedness. He explains in detail why French artillery was terribly inadequate and inaccurate, German artillery quite superior and its impact upon tactics and success. The army's bureaucratic defense of artillery contributes to a discussion of military intransigence and the struggles within the army regarding staffing, training, and promotions. French politics are reviewed along with their divisive role in military preparedness and general government. The Lost History. . . is actually a buried history. The French Army controlled all information (disinformation? 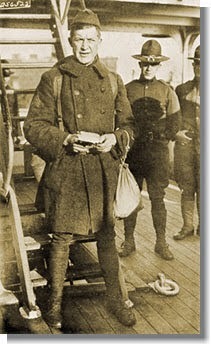 ), including casualties and thus the direction/status of the war. The French extrapolated German casualties from their own and claimed the enemy was being bled white while the reverse was closer to the truth. Further, each layer of command lied to the one above it as to the results of the latest offensive effort. While Joffre claimed that Verdun had three lines of defense, there was only one line of trenches and the others were just scratches in the earth. Many of the forts had been denuded of their artillery, ancient as it was, to make up for losses on other battlefields. The army stripped Fort Douaumont of so many military assets that it was seized by a few German soldiers who walked in and demanded the surrender of the elderly reservists. Nevertheless, the army claimed a ferocious battle with many German casualties had been fought. 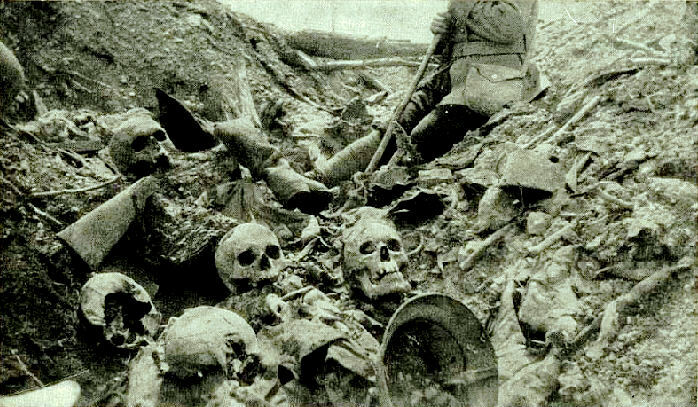 At book's end, Mosier compares the facts of Verdun to an ossuary, a jumble of buried matter. Nor were lies limited to the French. David Lloyd George wrote in his memoirs of how the British Army understated casualties, overstated enemy losses, with bad news hidden and good news glorified. Additionally, the 1918 contribution of American troops was denigrated by British historians. Yet von Hindenburg attributed the Allied victory to American infantry in the Argonne. 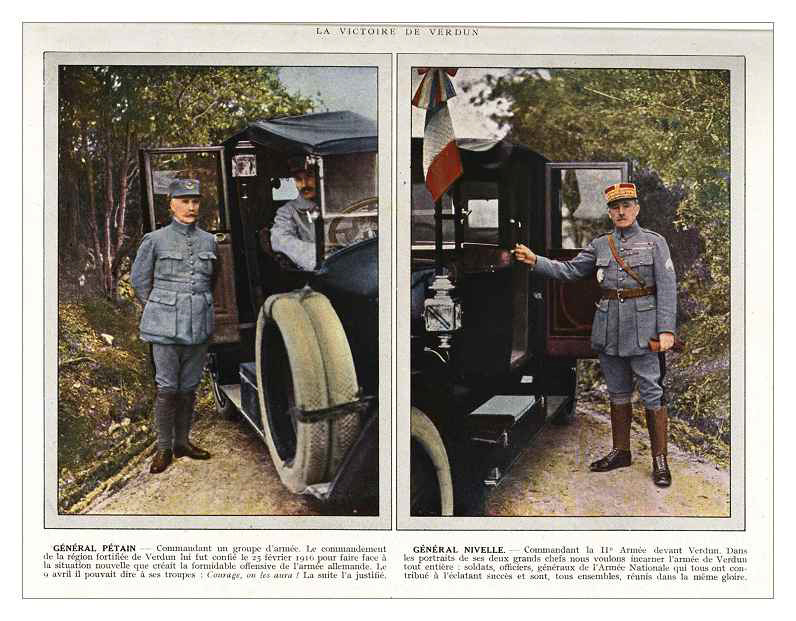 At the end of 1916 the reputations of French generals Philippe Pétain and Robert Nivelle were at a pinnacle. Nivelle's would be destroyed by the ill-fated 1917 offensive that bears his name. Pétain's, of course, would last until the Second World War. An even more basic misunderstanding is that Verdun was not one battle lasting several months but a series of battles, sometimes irrelevant to each other, and were not even close to Verdun, a small and militarily insignificant city, but were dispersed over a section of France that was geographically understood by very few. 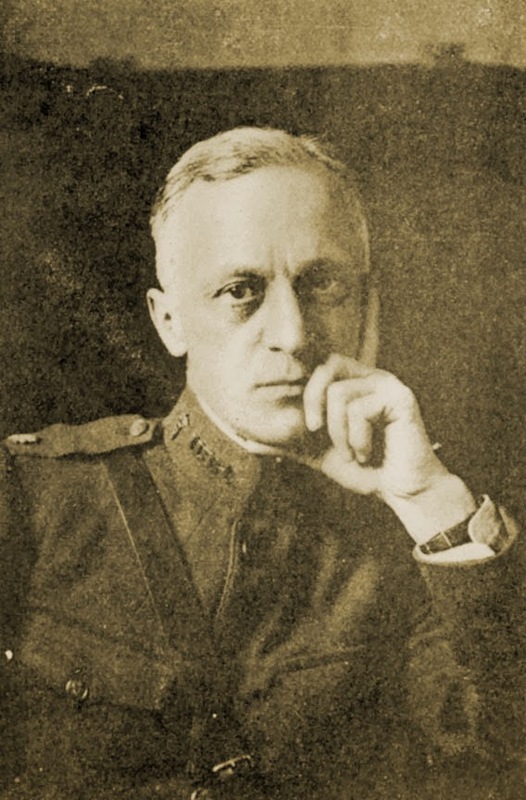 Mosier claims that the battle of Verdun began with the 1914 semi-fictional battle of the Marne and lasted through October 1918, when the Americans crossed the Meuse. The crux of the book is summed up in a quote from Sir Max Beerbohm, "History, it has been said, does not repeat itself. The historians repeat one another." Mosier points out how a postwar travel ad became the basis for the astronomical casualties around Verdun which was repeated by everyone until it became a historical "fact." While the book has maps, I found them too small with tiny print and thus inadequate. One map did not have a scale and the others were not described as English or metric although the text uses only the metric system. The text is very readable but at times too casual, "Denial is not only a river in Egypt." Despite this, the book is worth the read because of its preparatory information, fresh viewpoints, and continual struggles with official "truth." 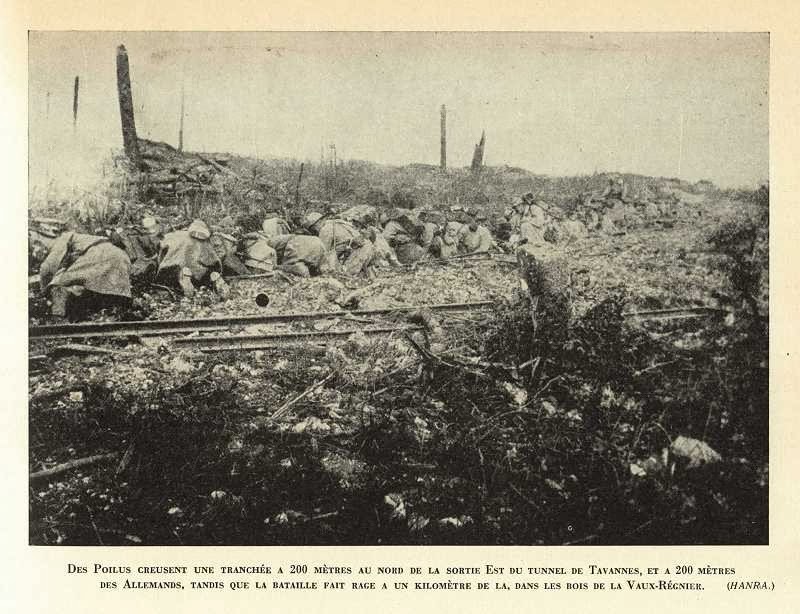 [In May 1916] The escadrille was ordered to the sector of Verdun. While in a way we were sorry to leave Luxeuil [in the Alsace], we naturally didn't regret the chance to take part in the aerial activity of the world's greatest battle. The night before our departure some German aircraft destroyed four of our tractors and killed six men with bombs, but even that caused little excitement compared with going to Verdun. We would get square with the Boches over Verdun; we thought it is impossible to chase airplanes at night, so the raiders made a safe getaway. The fast-flowing stream of troops, and the distressing number of ambulances brought realization of the near presence of a gigantic battle. Within a twenty-mile radius of the Verdun front aviation camps abound. 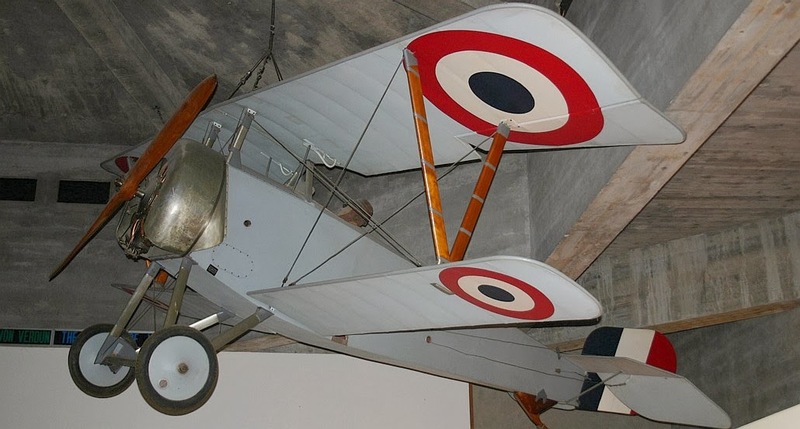 Our escadrille was listed on the schedule with the other fighting units, each of which has its specified flying hours, rotating so there is always an escadrille de chasse over the lines. . . The country below has changed into a flat surface of varicolored figures. Woods are irregular blocks of dark green, like daubs of ink spilled on a table; fields are geometrical designs of different shades of green and brown, forming in composite an ultra-cubist painting; roads are thin white lines, each with its distinctive windings and crossings - from which you determine your location. The higher you are the easier it is to read. a confused mass of troubled earth. Of the trenches only broken, half-obliterated links are visible. Columns of muddy smoke spurt up continually as high explosives tear deeper into this ulcered area. During heavy bombardment and attacks I have seen shells falling like rain. The countless towers of smoke remind one of Gustave Doré's picture of the fiery tombs of the arch-heretics in Dante's "Hell." A smoky pall covers the sector under fire, rising so high that at a height of 1,000 feet one is enveloped in its mist-like fumes. Now and then monster projectiles, hurtling through the air close by, leave one's plane rocking violently in their wake. Airplanes have been cut in two by them. 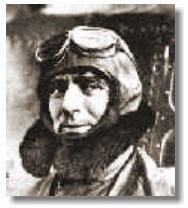 Author James McConnell, in March 1917, was the last American aviator killed by the enemy before America's entry into the Great War. "There, someone is lying out there!" I suddenly gasp in horror. "Where is he?" the sentry asks disbelieving. "There! Off to the right and up!" "Man, just leave him alone. He was already there this morning. Not even his teeth hurt him anymore" It seems to me as if he has moved!" "Are you nuts?" "Loan me your binoculars!" A murmuring growl shakes the earth and a dull, heavy crash resounds out there. Wrrrumnis! – A grey smoke cloud, coming from the rear, passes over the bit of blue sky out there. "Give it back and leave! It is starting up again!" the sentry insists. But I am fixated by the pile of rubble outside, where somebody is lying, half buried in the stones. "Stop, he is moving!" Very slowly, he turns in front of my eyes, close enough to touch, a grey, blood-crusted face; the eyelids open and close and the lips jerk open and then close. He is probably calling for help, for water. Nobody hears him. "Indeed, he is still alive. We cannot leave him like that!" "Let us see!" After a short look one sentry says, "It could be, you take a look!" to the other. He lowers the binoculars and gives a questioning look: "It is true. Who will bring him in?" "Medic!" "But that is not possible now, they would not make it in, and we will take a terrible plastering. Nobody may leave here by day due to the observation balloons." Douaumont is being shelled and shakes growling. Sand falls gently with each hit. Any moment the fellows over there might get the idea to shell the entrance. It is just 3:00 in the afternoon; it is still a long time until dark. One must wait. Who knows how many others lie out there like him without being able to help them! It is not my job. If I had remained asleep or not been so curious, I would know nothing about it. I can tell the medics. But, it is mean to see somebody lying like that and not help. What if I was lying out there? Who would have such fear, such cowardly, dog mean fear? I have often been lucky. Oh well, a shell will not come right off; I must try it! Otherwise I would be ashamed of myself. Without saying a word, I push the sentry aside and take a jump outside. White shrapnel clouds suddenly whirl in the air in front, splinters hiss and a shrill fuse coos past, dragging a spiral-shaped white smoke trail. A ripped open, prickly mine basket catches my foot and I fall. Pfanggm-trr, bubb-rr – resounds above me, and a hail strikes the dirt at the side, throwing up countless little dust clouds. Could I have not waited until that was over? Schu – schschua - schuschucschlicht – trrummm. What is that? In front of me a huge cloud stands over the wall, making it dark from smoke. Right there, where he is lying. It is better if I turn around now, because any moment now – there, there! It is coming directly at me – oh God, oh God! With a mighty heave I slide down into a deep, slippery crater; clomps collapse and something squeezes me tight, making me lose consciousness. Night falls over me, out of which earth and splinters rain. Probably they have seen me over there and now aim here, I image. And then – disgust and horror paralyze me – a haggard bone fist protrudes from the earth next to me, green-yellow, a corpse’s claw! Out! Away! Better to run a bit farther and remain there until it gets dark. 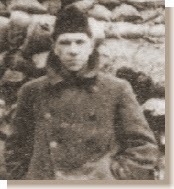 July 7th — Under a terrible bombardment I arrive at my command post in the bois Fumin at 2 am, followed by my battalion. We left at 22:30 and had only 3 kilometers to go. We marched for 3 and a half hour without stopping, except at the end of the route, when pesky Very lights obliged us to wait for a few seconds. We marched so hard and even ran at times, that we are literally exhausted. If you haven't been to Verdun, it's hard to believe you can only do one kilometer an hour. That's why officers who've never been on relief duty know nothing of one of the war's worst torments. That's also why headquarters make such awful mistakes in their calculations. July 10th — This is the 5th day I've been in battle (since this can rightfully be called an unending battle), three in the front lines, in contact with the Boche. Without let-up, heavy ordinance is falling all over, everywhere you look; at its worst, you can make out up to 12 explosions per minute: at other times it's less, but there are periods of 12 hour-long non-stop shelling. The earth trembles, ears roar. Everything shakes and trembles, isn't this hell? The earth in front of my shelter has been shattered and tossed about. Entering, I see a cadaverous-looking infantryman crawling out from the mixture of earth, stones and rubble. But after a few hours he's no longer the same; he's gone away and a tirailleur in khaki lies in his place. Then other cadavers and uniforms replace him. The shell that buries one seems to unearth another; and yet one gets used to these sights; you ignore the indescribable stench of the slaughter-house in which we live, but any joy in life will certainly be poisoned forever when the war is over. 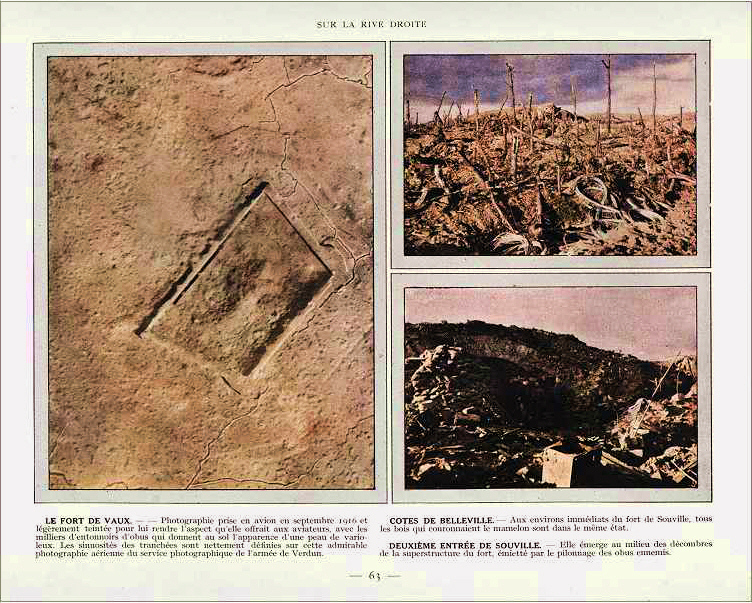 As far as you can see, and that is long way indeed, for I have a splendid panoramic view of Fort Douaumont and the surrounding heights, everything has been burnt, shattered, mixed up pell-mell with earth, rocks, debris, and bodies. Three images of the most intense areas of fighting throughout the battle that are on the right bank. If you have a map of Verdun these would be in the rough triangle: Fleury-Froideterre-Thiaumont. Fleury village changed hands 14 times in the fighting. Today it is classified a Village detruit. The Battle of Verdun wiped nine villages off the map so completely that the French government ordered that none should be rebuilt. Their sites have been largely overtaken by forest and apart from hunters, animals, and the occasional visitor, most of them are silent and forgotten. However, the destroyed villages have been allowed to retain a legal identity. Each one has a mayor, a chapel in which mass is celebrated once a year, and a village cemetery in which the descendants of those who lived in the village before 1914 may be buried today. Three of these villages are represented below. 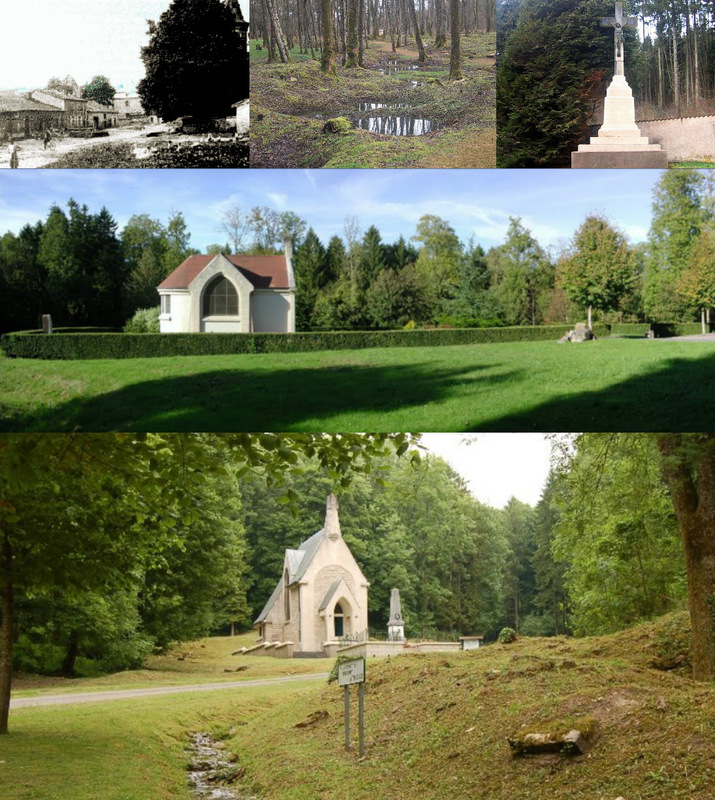 The top three-series of Bezonvaux: its main street prewar, the main street today, and the village memorial. Next are shown the chapels of Douaumont, namesake of the massive fort nearby, and Beaumont-en-Verdenois, which was just behind the opening action against Colonel Driant's outpost in Bois de Caures. Conceived as a battle of attrition, Verdun is one of history's most memorable testaments to the consequences of that strategy. 1. 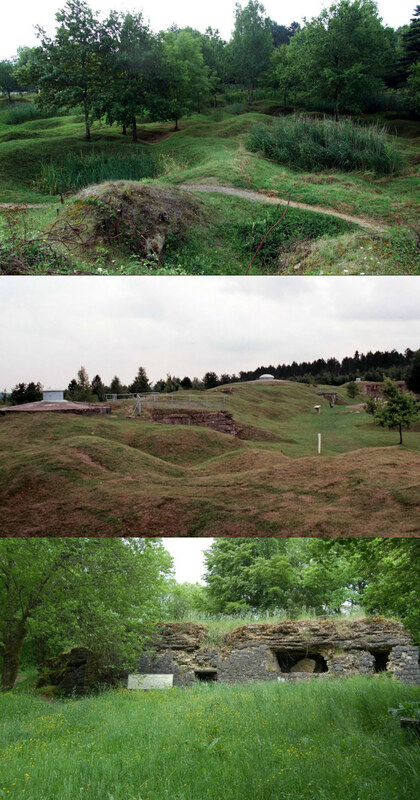 February – March: Initial assault on right [east] bank of Meuse includes capture of Fort Douaumont. 3. May – September: Relentless attacks and counterattacks; Fort Vaux falls in June; July Somme Offensive by Allies relieves some pressure at Verdun, with German "high-water" point on 11 July and the offense called to a halt on 2 September. 4. October – December: Major French counteroffensive supported by railroad artillery regains most lost territory and Forts Douaumont and Vaux. Battlefield was about 50 sq miles [30 sq miles on right bank, 20 sq miles on left bank]. 40,000,000 artillery shells were expended in the battle, about 60% by Germans. Under Pétain the French survived the initial crisis, slowing the German advance with a series of counterattacks. He also ensured that the Bar-le-Duc road into Verdun — the only one to survive German shelling — remained open. It became known as La Voie Sacrée ("the Sacred Way"). French units were rotated frequently; 2/3 of all French divisions served in the sector. World War II and Nazi Party notables Charles DeGaulle, Admiral Darlan, Rudolph Hess, Ernst Roehm, Heinz Guderian, and, of course, Marshal Pétain served at Verdun. 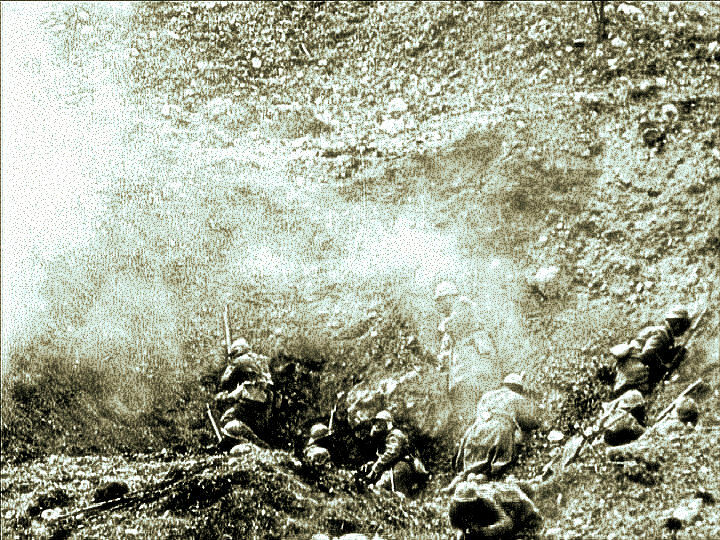 The "Verdun Experience" contributed to the French mutinies of 1917 and led to the "Maginot Line mentality" and the defeat of 1940. 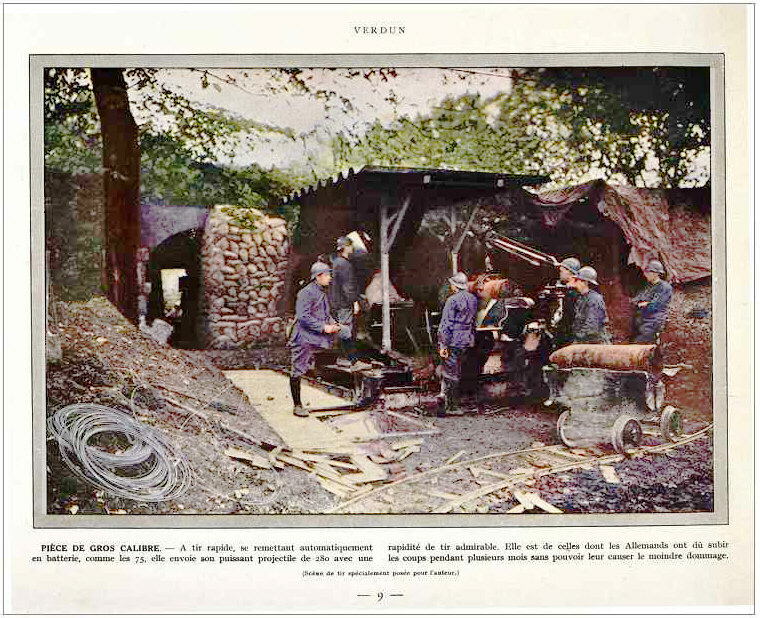 German efforts to flank the Verdun fortresses in the Argonne Forest (west of the city) and the Woevre Plain and Meuse Heights create a salient around Verdun. Early fighting is concentrated in shoulders of this salient, including intense fighting featuring mining operations around Vauquois in the Argonne and Eparges Spur in the St. Mihiel Salient. Kaiser Wilhelm approves chief of staff's 1916 plan featuring an assault against Verdun. German preparations begin for an assault on the left bank only. 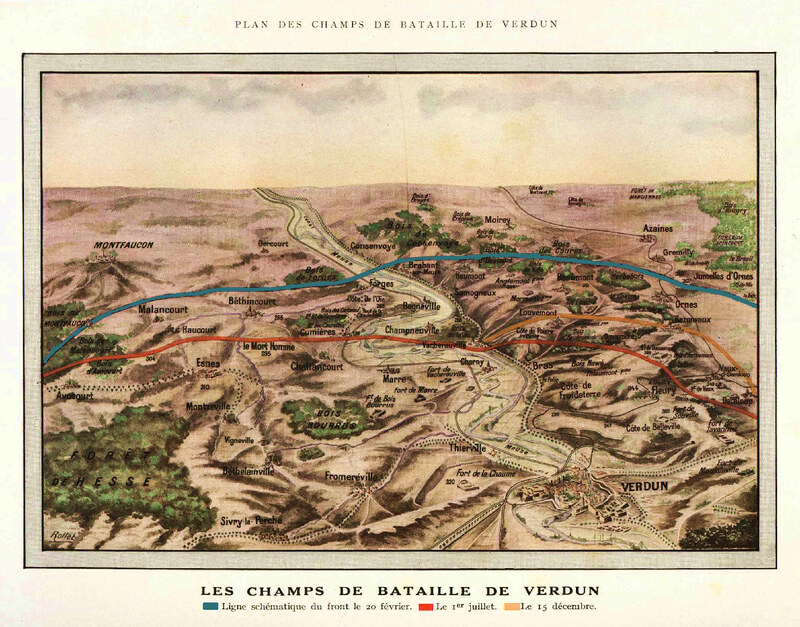 Earlier war games had emphasized the need to advance on Verdun along both banks. 21 Feb: Offense begins on right (east) bank of Meuse. 25 Feb: Fort Douaumont captured; Pétain takes over 2nd Army and the defense of Verdun. 6 Mar: German offensive expands to left bank of Meuse. Focus is on two hills controlled by the French, Mort Homme and Cote 304. 9 April: Major attack on left bank. 30 April: Robert Nivelle replaces Pétain as 2nd Army commander. 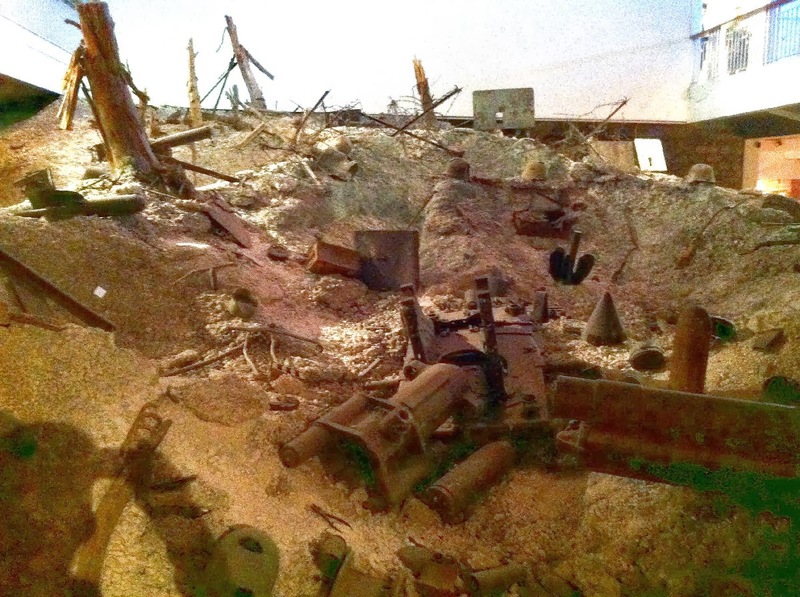 8 May: Explosion in Fort Douaumont kills 679 German soldiers. End of May: German forces occupy both Mort Homme and Cote 304. 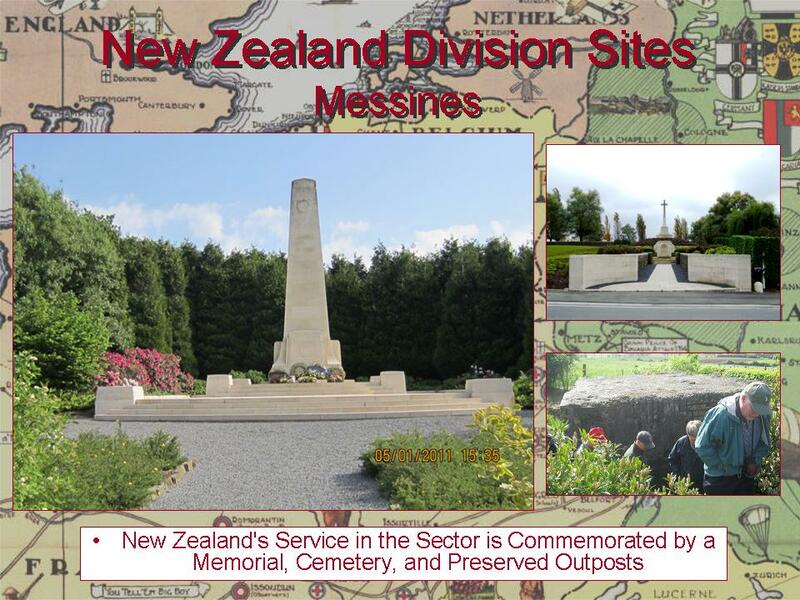 12 June: Bayonet Trench incident. 23 June: Nivelle's order of the day: "They shall not pass!" 29 June: Hill 304 in German hands. 1 July: Battle of Somme begins relieving pressure on the French. 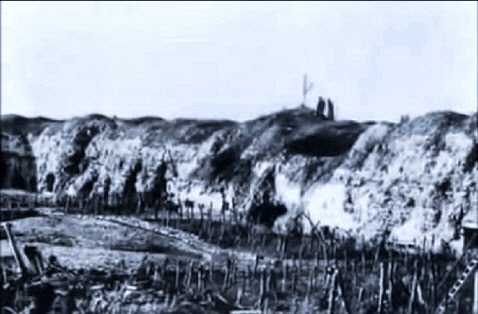 12 July: Assault on Fort Souville on right bank marks German High-water point at Verdun. 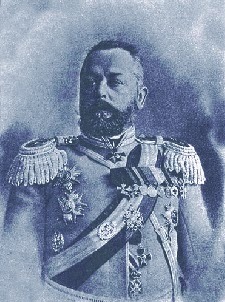 Late August: Falkenhayn resigns as chief of the German General Staff; replaced by Paul von Hindenburg. 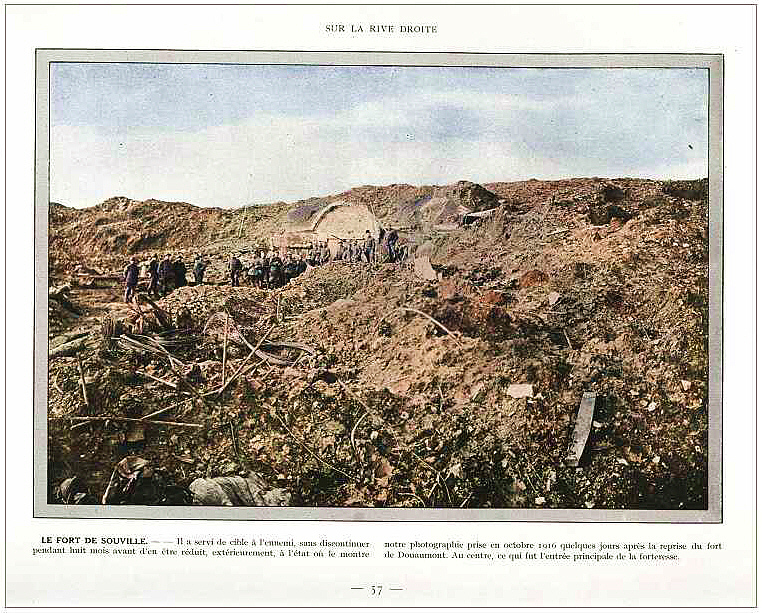 4 Sept: Explosion in Tavannes Tunnel kills over 500 French. 24 October: Fort Douaumont abandoned by Germans and recaptured. 2 Nov: Fort Vaux recaptured. 15 Dec: Major French attacks push line back close to February position on right bank. 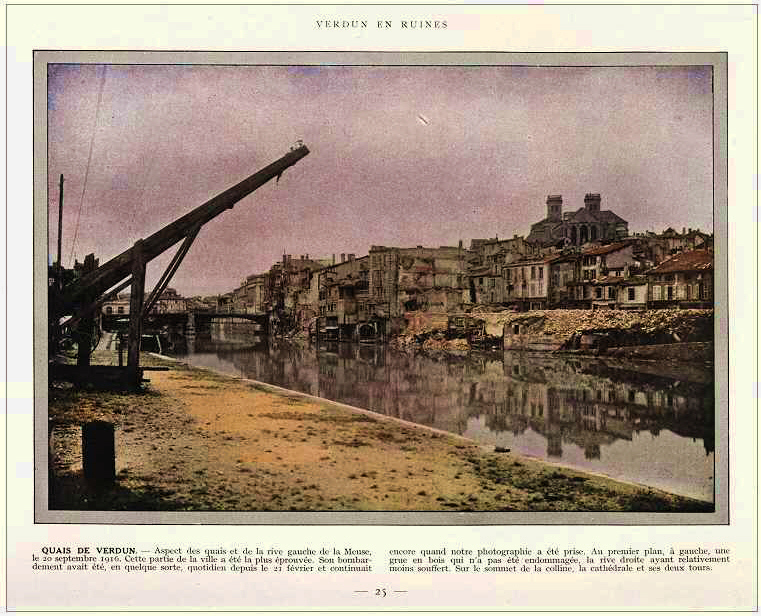 18 Dec: Major operations around Verdun halted. 20 Aug: Mort Homme recaptured by French. 26 September: American 1st Army launches offensive on left bank, later expanded across Meuse. Today we begin an eight-day series on the Battle of Verdun, which began 98 years ago and lasted 300 days, making it the longest battle of the Great War. The ambition of this book is to tell the story of Verdun by mixing the old history with the new, the cold calculus of terrain gained and shells expended, and lives lost with the depths of human experience on both sides. 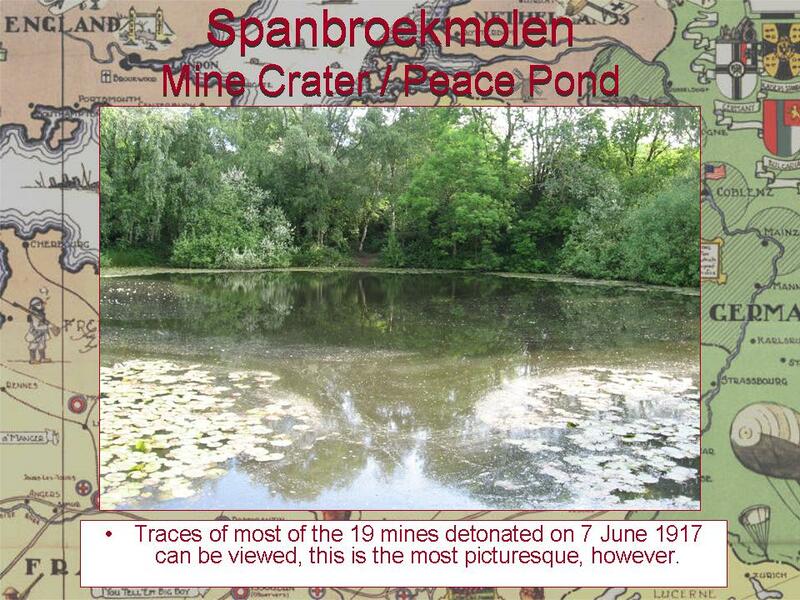 It aims to give the total history of the battle (p. 8). By successfully achieving the goals he outlines in the above quote, Paul Jankowski has given us one of the best studies of the Battle of Verdun available today. The book is also timely in that we are now entering the centennial period of WWI and that 21 February 2014 is the 98th anniversary of the start of Verdun's bloodletting. Other books have been written on Verdun, of course, including Alistair Horne's 1962 classic The Price of Glory and John Mosier's more recent Verdun: The Lost History (to be reviewed here next week). Doubtless other scholarly and historical studies exist or soon will. Literature has also dealt with the battle, most notably with the 1938 French epic novel Verdun by Jules Romains and the moving personal account in Martha Hanna's chapter "Here It Is Extermination on the Ground" in her Your Death Would Be Mine (2006). The genius and appeal of Jankowski's Verdun: The Longest Battle of the Great War is that the author so effectively combines both modes: the historical and the personal. Apparently the German intention was not so much to conquer Verdun as to practice Ausblutung, "the mortal bleeding of the enemy in a battle of attrition." The French, meanwhile, fought for their territory and their honor over the symbol of Verdun, ensuring that Ils n'ont pas passé. These aims inevitably led to the costly ongoing stalemate that Jankowski fully analyzes in his chapters dealing with the "offensive trap," "the prestige trap," and the "attritional trap" that the opposing armies fell into. 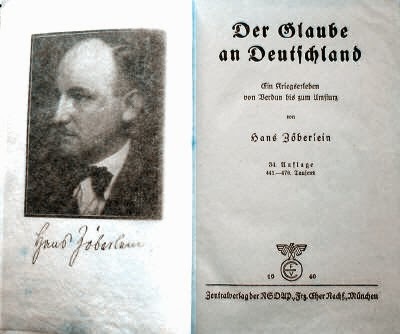 In Chapter 7, "The Nightmare," we are brought close to the experience of the soldiers, both French and German, through their letters and memoirs. Shells, shrapnel, mud, rain, rats, lice, hunger, and thirst all plagued the soldiers. Fear and despair found their place but also comradeship, loyalty, and even religious faith. 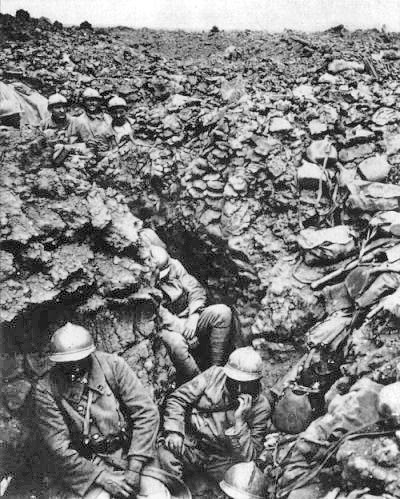 Resentment of those not at Verdun was widespread, as was the feeling of abandonment by politicians and senior officers. There are many ways of looking at Verdun, and more than one 'truth' to be discovered. The author takes all these perplexities, looks at them from various angles and based on solid research gives us multiple insights into the conflict. Why did the Germans attack Verdun? Was it to "bleed France dry?" 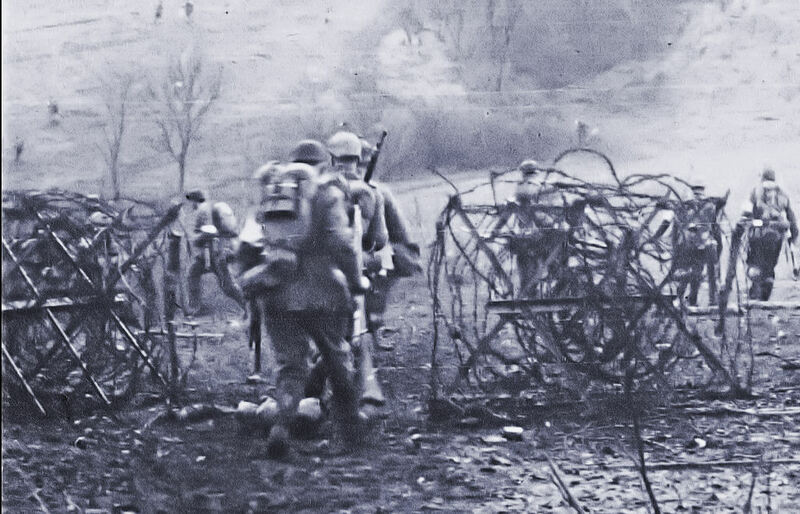 Was Verdun that important to the French — or to the Germans? How did the personalities of the politicians and generals shape what happened, and how were these events interpreted? When and how did Verdun reach the level of epic martyrdom and even myth in the minds of those involved? Jankowski provides ample material to enable us to see answers to these and other complex questions. When you read Verdun: The Longest Battle of the Great War, you feel you have been exposed to just about every event, maneuver, viewpoint, and emotion that can possibly be associated with the battle. The story is presented in coherent and clear prose solidly documented along the way with substantial source notes. Two helpful maps and several photographs enhance the book, and an impressive bibliography particularly rich in French and German sources rounds out the volume. Jankowski has given us the best of all worlds — an original, informative and scholarly work that is eminently readable. 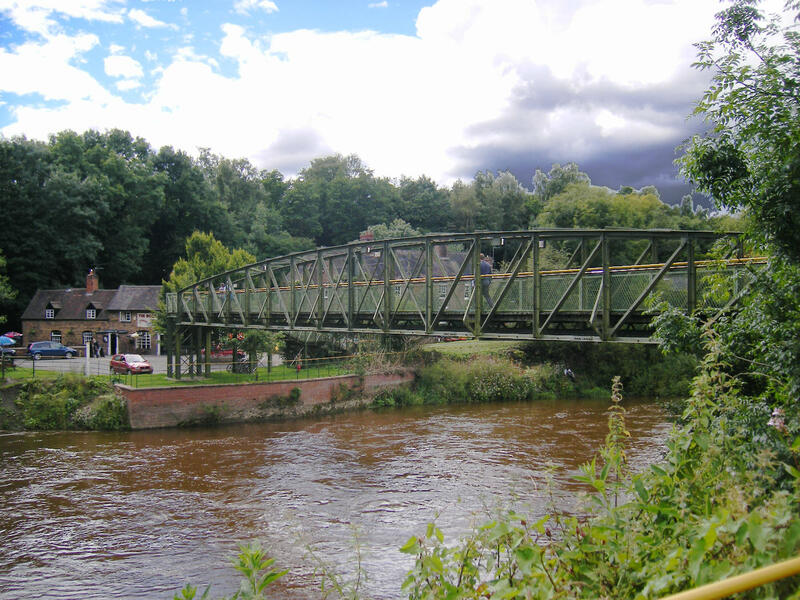 The footbridge opened in 1922 as a memorial to the 26 servicemen from Jackfield and Coalport who lost their lives in the Great War. 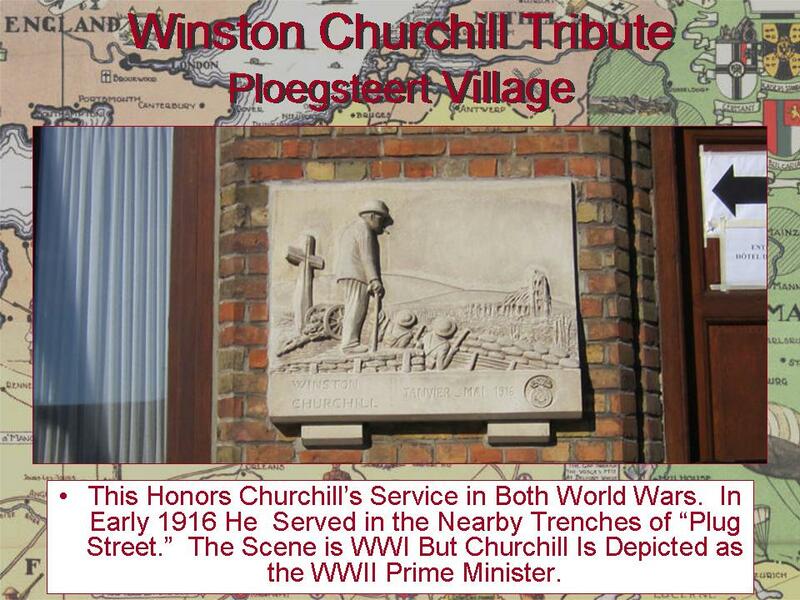 Local men lost in the Second World War were later included. Paid for by public subscription, it replaced the old fare-collecting ferryboat that linked the two communities. The new free footbridge made it much easier and safer for workers and families to commute from one side of the river to the other. The bridge was dismantled, repaired, and put back in place in 2000. Shown across the bridge, on the Jackfield side, is the Boat Inn, which was first licensed in 1840. It floods regularly, and the high point reached by the flood waters is recorded by the entrance. This is a non-comprehensive list of individuals who served in the AEF and went on to prominence in other fields of after the war. We've left out the generals, battlefield heroes, and most political types. Separate lists are being assembled for the Navy and volunteer groups. If you happen to have photos of any of these individuals please send them along. (email) We will be featuring them on the Doughboy Center website in the future. 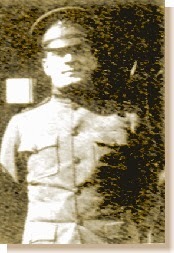 101st Field Artillery; 26th Div. 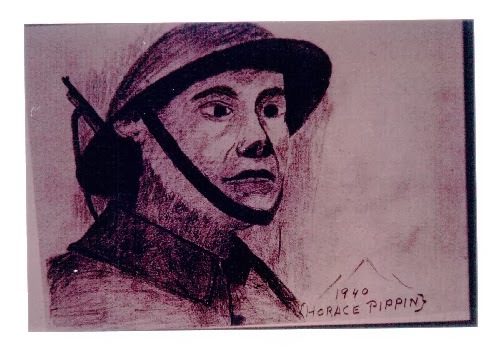 304th Labor Btln, 79th Div. 31st and 305th Fld. Art. 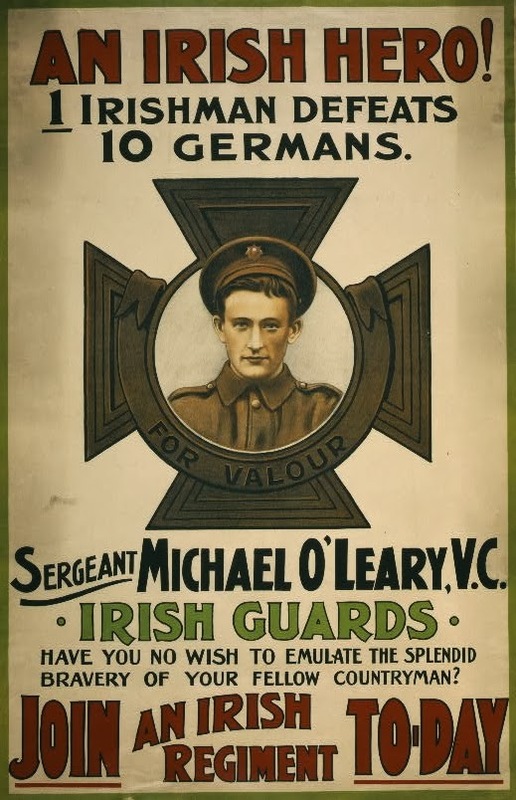 Over 200,000 Irish fought in the war for the British Army and over 35,000 died. The majority who served — even taking into account the 36th "Ulster" Division, which was formed from the exclusively protestant Ulster Defence Force — were Catholics. Recruitment was lower by percentage in Ireland than in England, Scotland, or Wales, but this was due primarily to Ireland's higher proportion of population committed to agriculture. 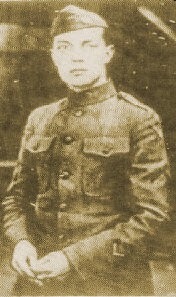 Irish immigration to America was halted in 1915, otherwise some of the participants in the 1916 Easter Uprising could have been in America. Due to the war, important improvements in nutrition and child care were implemented in Ireland. Because of war restrictions, the output of Irish breweries and distilleries was only half in 1918 of what it was in 1916. 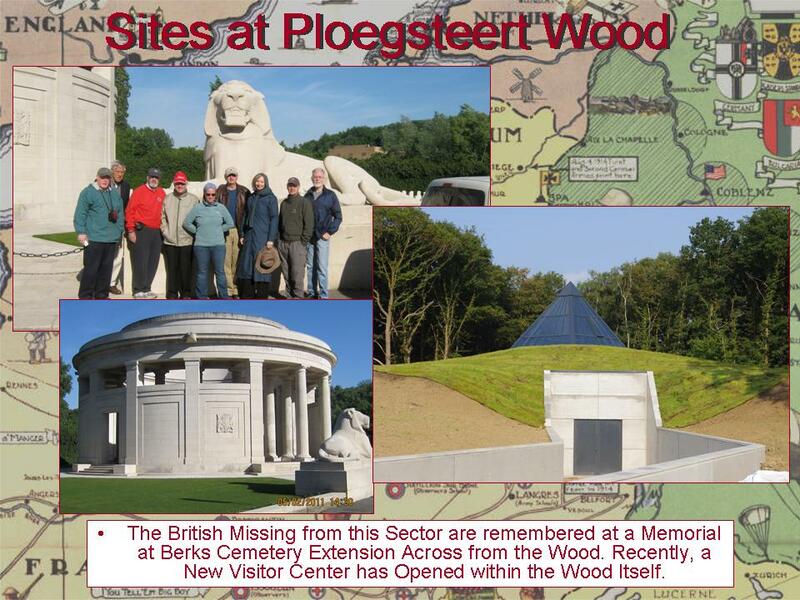 Stop 8: Messines and "Plug Street"
This week we visit some of the most famous sites south of Ypres, between the villages. 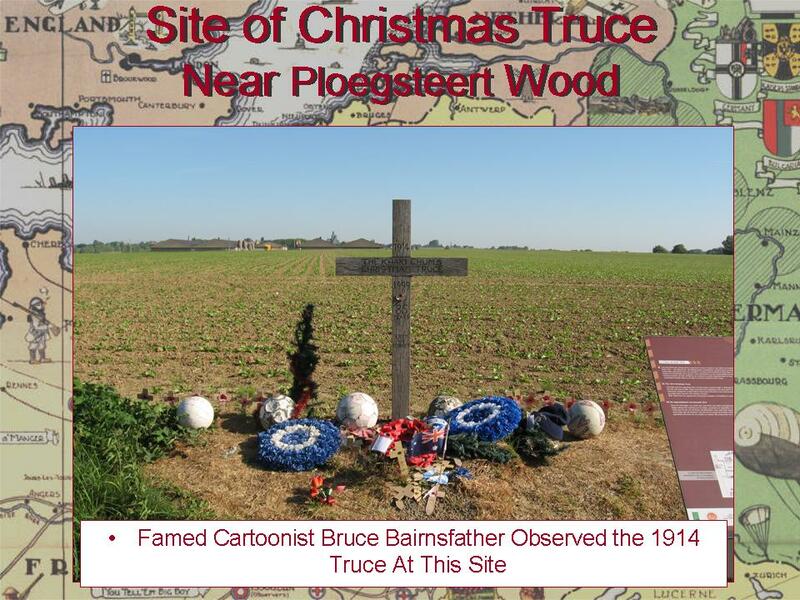 The area is most famous for two events, the 1914 Christmas Truce and the 1917 campaign which began on 7 June with the explosion of 19 mines. As always, there are many more interesting things to see in the area than we have space to show you in this entry.